Even though the American College of Obstetricians and Gynecologists (ACOG) and the National Institutes of Health (NIH) have described vaginal birth after cesarean (VBAC) as a safe, reasonable, and appropriate option for most women, VBAC bans (hospital or practice wide mandates that requires repeat cesareans for all women with a prior cesarean) remain in force in almost half of American hospitals. It's true that scheduled repeat cesareans almost always successfully circumvent the most publicized risk of VBAC (uterine rupture) by virtually eliminating its incidence and for this reason, many people celebrate and credit the repeat cesarean section for resulting in a good outcome for mother and baby. But what most people do not consider is that VBAC bans translate into mandatory repeat cesareans, and those surgeries expose women and babies to a condition far more life-threatening and difficult to treat than uterine rupture: placenta accreta. 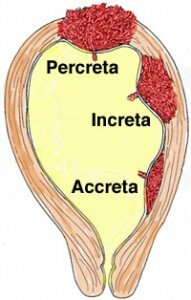 Placenta accreta occurs when a placenta abnormally attaches to (accreta), in (increta), or through (percreta) the uterine wall. No one knows exactly why some women develop accreta other than there is some abnormality in the area where the fertilized egg implants (Heller, 2013). Anyone who has had a prior surgery on her uterus is at a substantially increased risk of accreta and, as it happens, cesarean section is the most common surgery in the United States (Guise, 2010). In fact, the rate of accreta has grown along with the rate of cesarean surgery: from 1 in 4,027 pregnancies in the 1970s, to 1 in 2,510 pregnancies in the 1980s, to 1 in 533 from 1982-2002 (American College of Obstetricians and Gynecologists [ACOG], 2012). That rate escalates to 1 in 323 among women with a prior uterine surgery and the risk rises at a statistically significant rate with each additional cesarean section (Silver, Landon, Rouse, & Leveno, 2006). Up to seven percent of women with accreta will die from it (ACOG, 2012). After the baby is born, the placenta does not detach normally, causing bleeding, which can't be stopped before the doctors are able to either surgically remove the placenta or perform an emergency cesarean hysterectomy. Babies die from accreta due to the very high rate of preterm delivery associated with accreta. In fact, 43% of accreta babies weigh less than 5.5 lbs (2,500 gm.) upon delivery (Eshkoli, Weintraub, Sergienko, & Sheiner, 2013). Accreta is not a routine complication. Accreta is serious. As Silver (2006) points out, the risk of accreta after two cesareans (0.57%) is greater than the risk of uterine rupture after one prior low transverse cesarean during a non-induced/augmented planned VBAC (0.4%) (Landon, Hauth, & Leveno, 2004). In other words, women are literally exchanging the risk of uterine rupture in a current pregnancy for the more serious risk of accreta in future pregnancies. This poses a striking public health issue when you combine what the CDC (2012) has reported for numbers of unintended pregnancies - 49% - and the lack of access to vaginal birth after cesarean: over half a million repeat cesareans every year, resulting in higher rates of accreta. Yet due to the nonmedical factors that inhibit access to VBAC and influence how the risks and benefits of post-cesarean birth options are communicated to the public, women are rarely informed of these risks in a transparent and straightforward way. Additionally, it can be very difficult for the woman to obtain social support when confusion and fear about giving birth after cesarean remains the norm. Given all this, providers are ethically obligated to inform patients of the future implications of their current mode of delivery. However, it can be especially difficult for providers working within the political climate of a hospital where VBAC is banned to frankly inform their patients of this reality. How can providers clearly explain to women the risks and benefits of their options, with VBAC as a viable option, when they do not offer that option at the facility? Such a situation could even result in professional ramifications for the provider, like revocation of hospital privileges. Additionally, some providers do not offer VBAC, "not because of an explicit hospital policy against it, but because [they] were unwilling to stay in the hospital with a woman attempting [a planned VBAC]" (Barger, Dunn, Bearman, DeLain, & Gates, 2013). It is for this reason that some argue that VBAC bans create a conflict of interest among providers (ACOG, 2011; Charles, 2012). On one hand, they are bound by ethical obligations to the patient's well-being, respect for patient autonomy, and support of an informed decision-making process. But these obligations are threatened by financial and professional ties to the hospital. ACOG stresses throughout their guidelines and committee opinions that informed consent and patient autonomy are paramount (ACOG, 2011). They share how obstetrics should be moving from a paternalistic system to a more collaborative model (ACOG, 2013). They acknowledge that women should be allowed to accept increased levels of risk (ACOG, 2010). They assert how there is no "right" or "wrong" answer, only what is right or wrong for a specific woman (ACOG, 2010). And they are clear that restrictive VBAC policies cannot be used to force women to have a repeat cesarean or to deny a woman care during active labor (ACOG, 2010). Yet, with 48% of women interested in the option of VBAC, 46% of them cannot find a provider or facility to attend their VBAC (Declercq, Sakala, Corry, Applebaum, & Herrlick, 2013). Only 10% of U.S. women have a vaginal birth after cesarean, as opposed to another cesarean (National Center for Health Statistics, 2013). Barriers to VBAC remain firm. Those barriers often include one-sided counseling to women of the risk of uterine rupture in a VBAC. Rarely are they told of the complication rates of accreta, which are higher across several measures. This is true when we look at maternal mortality (7% vs. 0%) (ACOG, 2012; Guise, et al., 2010), blood transfusion (54% vs. 12%) (Eshkoli, Weintraub, Sergienko, & Sheiner, 2013; Barger, et al., 2012), cesarean hysterectomy (20-70% vs. 6%) (Eshkoli, Weintraub, Sergienko, & Sheiner, 2013; Barger, et al., 2012), and maternal ventilation (14% vs. 3%) (Eshkoli, Weintraub, Sergienko, & Sheiner, 2013; Barger, et al., 2012). Further, 5.8% of accreta babies will die within the first week of life (Eshkoli, Weintraub, Sergienko, & Sheiner, 2013) in comparison to 2.8 - 6.2% of uterine rupture babies (Guise, et al., 2010). Accreta results in higher rates of mortality and morbidity because it requires a complex response which most hospitals are not equipped to provide. A 2012 study advises, "Treatment of placenta accreta is best accomplished in centers that have the expertise to handle the management, which involves multiple disciplines, including blood bank, interventional radiology, anesthesia, and surgical expertise, gynecologic oncology, urology, or obstetric subspecialty expertise" (Heller, 2013). It Ã­s worth noting that uterine rupture does not require this level of response in order to generate a good outcome. As Aaron Caughey, OB-GYN and Chairman of the Department of Obstetrics and Gynecology at Oregon Health & Science University in Portland explains, "From an obstetrician standpoint, there are no particular special skills to managing a VBAC. Even in an emergency situation, we all have the surgical skills to deal with it" (Reddy, 2014). Because some hospitals are not equipped to manage an accreta, some women who are diagnosed prenatally find themselves traveling hundreds of miles away from their family in order to deliver with accreta specialists. At 19 weeks pregnant, Dawn was diagnosed with percreta, the most severe form of accreta where the placenta goes through the uterine wall and attaches to other structures in the abdominal cavity. She had nine prior pregnancies. Dawn was among the 93% of women who were never informed of the risks of accreta when she was pregnant after her first, second, or third cesarean (Kamel, 2014). All she heard were the dangers of VBAC. Thus, she had three cesareans. Mother after cesarean hysterectomy in ICU. When she got pregnant again, she heard the word accreta for the first time upon her diagnosis as is the case in 59% of women diagnosed with accreta (Kamel, 2014). Dawn ultimately traveled from her home in rural Virginia to Houston, Texas, at 27 weeks pregnant, to the Fox-Texas Children's Pavilion for Women, an accreta specialty center. Due to complications related to her percreta, her son was delivered by cesarean hysterectomy at 33 weeks. Her son spent 19 days in the NICU before they could return back home to Virginia (personal communication, March 30, 2014). It's because accreta is so dangerous, complex to treat, and unknown to the general public, that professionals and researchers are sounding the alarm about the risk exchange that happens when repeat cesarean is chosen (or forced) over VBAC. As Dr. Elliot Main, Medical Director of the California Maternal Quality Care Collaborative, cautions, "In California, we are seeing a lot of hysterectomies, accretas, and significant blood loss due to multiple prior cesareans. Probably the biggest risk of the first cesarean is the repeat cesarean" (Main, 2013). (The state of California has a 9% VBAC rate, just a point below the national rate) (State of California Office of Statewide Health Planning and Development, 2013). A 2009 study from the Netherlands advises, "Ultimately, the best prevention [of uterine rupture] is primary prevention, i.e. reducing the primary caesarean delivery rate. The obstetrician who decides to perform a caesarean has a joint responsibility for the late consequences of that decision, including uterine rupture" (Zwart, et al., 2009). And a 2012 study warns, "Because cesarean delivery now accounts for about one-third of all deliveries in the United States, rates of abnormal placentation and subsequent hysterectomy will likely continue to rise" (Bateman, Mhyre, Callaghan, & Kuklina, 2012). By reducing the primary cesarean rate and increasing access to VBAC, we could also reduce the incidence of accreta, cesarean hysterectomy, and hemorrhage. Following multiple uterine rupture lawsuits in the 1990s, some hospitals crafted their restrictive VBAC policies around litigation fears. However, the concern over lawsuits resulting from "VBAC gone wrong" may soon be overshadowed by the worry of being sued when women or babies die from accreta, after failing to adequately respond to this dangerous condition and/or denying access to VBAC (Associated Press, 2013; Children to sue hospital over death of mother, n.d.). This will certainly become the case as the public becomes more aware of the connection between VBAC bans, cesareans, and accreta. It could also become a public relations nightmare as Americans begin to realize that litigation fears - not patient safety, drive hospital policy. This becomes more likely as more women are diagnosed with accreta. As mothers are the ones who carry the risk of either uterine rupture or accreta, shouldn't they be the ones deciding which set of risks are tolerable to them? As ACOG (2010) says, "the ultimate decision to undergo [planned VBAC] or a repeat cesarean delivery should be made by the patient in consultation with her health care provider" - not by hospital administrators, malpractice insurance companies, or providers who simply don't want to deal with VBAC. As Dr. Howard Minkoff (2010) shared at the 2010 NIH VBAC Conference, "We should be starting with a sense of what's the best interest of the mother. Unfortunately, the decision here is not always who are better equipped, it's more like who are willing. There are a lot of hospitals that are quite capable of providing VBACs but exercise an option not to do it particularly if there's someone nearby that will take that on for them." Hospitals around the country, and particularly those that are located in areas where VBAC bans mean that all women have repeat cesareans, are seeing and will continue to see increasing numbers of accreta. They have no choice but to manage it - which can be especially problematic for smaller facilities in rural areas that don't offer the sophisticated response accreta requires. But motivation remains the driving factor in hospital VBAC policy even in rural hospitals. Take the five small community hospitals in New Mexico that serve the Navajo Nation. As Dr. Jean Howe (2010), their Chief Clinical Consultant for Obstetrics, shared at the 2010 NIH Conference, these rural facilities collectively deliver 3,000 babies each year and maintain a 15% cesarean rate and a 38% VBAC rate. Numbers like that just don't happen. They are the result of motivated administrators, providers, and patients who want VBAC to be an option at their facility. The bottom line is, VBAC bans simply delay risk. The sooner hospital administrators and the American public realize this, the sooner we can mobilize - reducing future risks of accreta by making VBAC a viable option in more hospitals. 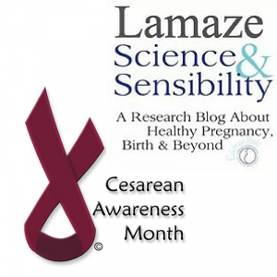 It is one thing for a woman to knowingly plan a repeat cesarean understanding this risk. That is her choice as both VBAC and repeat cesarean come with risk. However, it is unconscionable when a woman is not presented with her options and she develops accreta in a subsequent pregnancy. As the American public becomes more aware of the serious risks associated with repeat cesarean, will more providers and facilities be sued as a result of accreta-related complications and death? Will it have to come to fear of litigation, again, in order for hospitals to throw aside their current VBAC bans, listen to what the NIH, ACOG, and the medical research has to say; to create an environment that is supportive of VBAC, respect a mother's right to make her own medical decisions, and prepare accreta-response protocols? Women are entitled to understand what that first cesarean means in terms of their future birth options and their long term health. Consumers and providers should work with hospital administration to reverse VBAC bans, review current VBAC policies to insure they are aligned with national guidelines and evidence, and improve response times for obstetrical emergencies through team training and drills (Cornthwaite, Edwards, & Siassakos, 2013). Providers should have frank conversations with patients about the immediate and long-term risks and benefits of their options within the context of intended family size, acknowledging that sometimes the stork delivers when you're not expecting it. This is about administrators, providers, professionals, and consumers working together for better processes and healthier outcomes. Let's get to work. Barger, M. K., Nannini, A., Weiss, J., Declercq, E. R., Stubblefield, P., Werler, M., & Ringer, S. (2012, November). Guise, J.-M., Eden, K., Emeis, C., Denman, M., Marshall, N., Fu, R., . . . McDonagh, M. (2010). Kamel, J. (2014, Dec 14). Online poll of 227 women with prior cesareans. Main, E. (2013). HQI Regional Quality Leader Network December Meeting. San Diego. National Center for Chronic Disease Prevention and Health Promotion, Division of Reproductive Health. (2012, Apr 4). Jen Kamel is a consumer advocate and a leading national speaker on the medical facts and political, historical climate surrounding vaginal birth after cesarean. 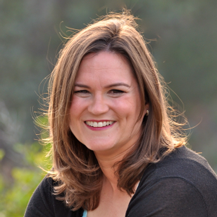 She is the founder of VBACFacts.com and has brought her workshop "The Truth about VBAC: Politics, History and Stats" to over 900 people around the country, giving accurate, current information about post-cesarean birth options directly to families, practitioners, and professionals. This program is also available online. Jen also offers a complimentary email course on VBACs. Sharon Muza, BS, LCCE, FACCE, CD/BDT(DONA), CLE has been an active perinatal professional since 2004, teaching Lamaze classes and doula-ing to thousands of families through her private practice in Seattle, WA. Sharon is also a trainer of new birth doulas and childbirth educators. Sharon enjoys facilitating discussion around best practice, current research and its practical application to maternal infant health community standards. To learn more about Sharon, you are invited to visit her website, SharonMuza.com.